英文摘要：Aimed at the worse corrosion situation of equipment and pipeline owing to the high salted sewage, the corrosion mechanism analysis is conducted. 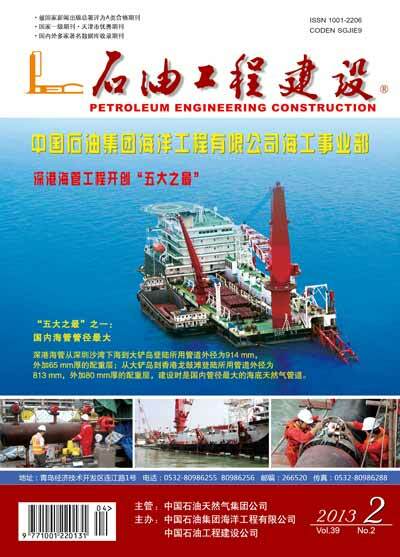 The sewage corrosion in Jianghan Oil Field is caused basically by electric chemical corrosion and bacterial corrosion. The dominant influence factor of electric chemical corrosion is sewage flovving velocity and content of dissolved oxygen, ΣFe and pH value. Through studying of cathodic protection, corrosion moderator, anti-corrosion coating and corrosion monitor, a set of synthetic methods to bring high salted sewage corrosion under control are established. It includes common methods, such as disinfection, removing oxygen, regulating pH value, using high efficient corrosion moderator and optimum coating, applying cathodic protection for different parts of facility. After the efforts are made, the sewage corrosion rate is controlled at level less than 0. 05mm/a with protection electric potential -0.90-- 1. 20V and protection degree of 85%-90% for internai wall of oil tank as well as sewage corrosion-0. 87-- 1. 50V with protection degree of 85%-93% for external wall of oil tank.